Hi Amigos, and Welcome Back to Covers from the Unknown! Today's episode looks at a very obscure comic. 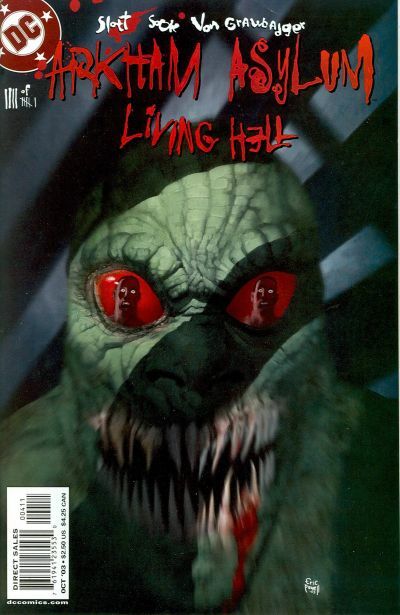 A relatively unknown Batman title, Arkham Asylum Living Hell 4, from late 2003. So why this comic you ask? Well, I for one always look for cool covers, right after first appearances and origin stories. And this just happens to be one of the best Killer Croc covers out there. With the announcement that he will be in the Suicide Squad movie, this has the possibility to generate some heat. As it stands now, everyone is going after his first appearances. Sooner or later, they will start to hunt the “cool” covers. Unless this really takes off, the print run of approximately 25,000 should calm the masses. But you can never really tell with comics these days! For now, they are found pretty easily on the bay, and amazon, normally for $5 and under. My guess is if you look hard enough, you can find them at your LCS and $1 bins also! Also, one other thing I forgot to mention, the cover is by Eric Powell! Happy Hunting Fellas! That is an amazing cover! I just read my article, and forgot to put a very important part! The cover is by Eric Powell! —–I just edited it to include now! Ill have to grab this one, great cover! Oh sweet! Thanks for letting us know of this.